When looking for exterminators, your home is one of the single largest investments you will make in your life. Like your other investments, you need protection from all kinds of pests- ants, roaches, rodents, silverfish, termites and other uninvited guests. 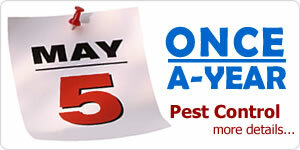 With our pest control services, we guarantee a safe, effective and professional job every time. Through years of education, training, modern technology and years of experience, we will be able to provide your home with the best termite and pest control protection possible. When it comes to bugs of all kinds, our exterminators have one thing in mind- to ensure that we successfully provide homeowners like you with the best termite control and pest protection available.